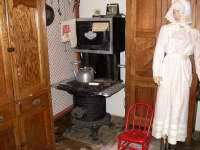 Description Cook Stove, The Cole's patent high oven ( on double stove pipe) Range Pat. May 24,1898 No. 8E-2. Made by Cole Mfg. Co. Chicago, Ill. Has coal shovel, 4 stove lids lifters, two long handle stove pokers, one wrench to shake down the ashes, two decorated hot (steel) plates, two pieces for each side of stove. This stove came from St. Louis Mo. and was given to Mr. Molyn in 1885 from the firm where he purchased merchandise for this store. Notes I question the date of paten and the date that Molyn bought the stove.